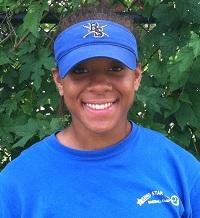 Misha Green handles various administrative responsibilities at Rising Star Baseball Camp. These duties include, camper registration, water bottle/t-shirt distribution, popsicle/prize inventory, equipment supervision, parent communications, and much more. As the captain and top player on her varsity basketball and lacrosse team(s) in high school, Coach Green is familiar with athletic achievement, leadership, and responsibility. Currently, Coach Green attends and is the captain of her basketball team at SUNY Plattsburg University.